One of the least known yet most fascinating regions of Spain, Extremadura is a remote region, bordering Portugal, with areas of mountains, forests, steppes, lakes and nature reserves. On arrival at Seville airport collect your hire car and self drive (142km /c.1 hour 30 minutes) to the Parador in Zafra. This 15th century castle, once the residence of the Dukes of Feria, is now a 4-star hotel with beautiful ceilings, antique furniture, intricate ironwork and large, elegant guestrooms. Overnight at Parador de Zafra, Zafra. Zafra is a captivating town to explore - known locally as ‘Little Seville’ (La Sevilla Chica). Its main feature is the castle, formerly a Moorish fortress that now serves as the Parador. This fortified town has eight entrances of which Jerez Gate is by far the most attractive. It leads onto Clavel Street, a narrow thoroughfare bordered by decorative tiles and pretty flowers adorning overhanging balconies. After breakfast, drive to Cáceres (137km /c.1 hour 20 minutes) via Mérida. Founded by the Romans in the 1st century B.C, Mérida is rich in Roman architecture from the still-used Romano Theatre and Roman Bridge spanning 792m across the Guadiana River to the chariot racing Circus Maximus and the largest Roman Art Museum in Europe outside Rome. Overnight at Parador de Cáceres, Cáceres. Explore the impressive UNESCO World Heritage Site of Cáceres. The city has been shaped over the centuries by Roman, Arab, Jewish and Christian rule which have all left their mark. Walk through the labyrinth of streets and squares with its many ancient arches and towers, Arabic walls and medieval fortified houses. The town is particularly atmospheric at night. Today, depart for the Parador de Guadalupe (128km /c.1 hour 50 minutes) with a stop en route at Trujillo - one of the most fascinating medieval towns in Spain. On top of a hill overlooking the centre of Trujillo is a fortress which affords fabulous views over the town and surrounding area. There is a small, fascinating museum - the Casa Museo de Pizarro (his former home), which highlights the life and times of the conquistador Francisco Pizarro, who conquered the Inca Empire. He also has an equestrian statue dedicated to him in Plaza Mayor. Overnight at Parador de Guadalupe, Guadalupe. Take a walk through this historic village with its cobbled streets, traditional houses and most famous monument - the Royal Monastery of Santa María de Guadalupe which has been declared a UNESCO World Heritage Site. Alternatively, you can explore the nearby mountain towns within the region of Las Villuercas such as Cañamero, Logrosán and Berzocana. After breakfast, drive to your final destination, Plasencia. The Parador offers the perfect location from which to explore the ancient city and its beautiful surrounding landscapes. The city centre, declared a Cultural Heritage Site, has a wealth of historic buildings, palaces, cathedrals, an aqueduct, medieval walls and fortified towers and gates. Overnight at Parador de Plasencia, Plasencia. Visit the Sierra de Gata Mountains and Jerte River Valley. Here you will see gushing waterfalls, nature trails, pretty historic towns and taste the local delicacies such as the delicious Ibérico ham and exquisite Torta del Casar cheese. If you visit the Jerte valley in spring you will also see the cherry trees in blossom. The valley is ablaze with white petals which only happens for a couple of weeks towards the end of March and the beginning of April - subject to weather conditions. After breakfast, drive to Madrid airport (265km / c.2 hours 35 minutes) for your flight home. This grand 15th century castle, once the residence of the Dukes of Feria, is located in the Medieval quarter of Zafra. Today, it serves as a 4-star hotel with beautiful ceilings, antique furniture, intricate ironwork and large, elegant guestrooms. The exterior is equally impressive with a spectacular façade, nine Moorish towers, well maintained gardens and an outdoor swimming pool. Zafra is a captivating town located in southern Extremadura half way between Seville and Caceres and which is known locally as ‘Little Seville’ (La Sevilla Chica). Its main feature is the castle, formerly a Moorish fortress, that now serves as the Parador of Zafra.There is a main square ‘Plaza Grande‘ which is lined with magnificent arches where you will find many bars and cafés, and where one archway connects to ‘Plaza Chica‘, a smaller version of the larger square. This fortified town has eight entrances of which Jerez Gate is by far the most attractive. It leads onto Clavel Street, a narrow thoroughfare bordered by decorative tiles and pretty flowers adorning overhanging balconies. These and many more attractions make Zafra a place of great interest for any visitor. Located in the heart of the old city, this is an elegant and chic Parador in what was once a renaissance palace. Many of the original features of the building have been kept, with vaulted ceilings, granite pillars and colonnades very much in evidence. Room facilities here are very modern but very much in keeping with the traditional style of the palace. The Parador has a small shaded garden to one side. The restaurant features traditional local cuisine with Iberian lamb shank and Iberian pork loin being specialities. It is the location of the Parador which is so special, blending perfectly into the historic centre and within reach of the many squares, restaurants, cafés and tapas bars. The evenings are especially magical, with that sense of mystery which is always present in ancient cities with narrow streets and sympathetic lighting. The Parador is well located in the centre of town next door to the Royal Monastery of Santa Maria de Guadalupe, a UNESCO World Heritage Site. Rustic in style, the Parador has many appealing features including an interior courtyard filled with the scent of citrus fruits (oranges and lemons), pretty gardens with fountains and a secluded swimming pool. There are white-washed walls, archways and cosy guestrooms, many with traditional wooden shutters. Guadalupe is a charming town with cobbled streets and traditional houses located in northern Extremadura. The town essentially grew around the famed monastery of Guadalupe, one of Spain’s most popular tourist attractions. A statue of the Virgin Mary was discovered in a field in 1325 by a farmer and it was thought to be carved by St Luke. A shrine was built to house it as it attracted people far and wide to see it. The monastery complex consists of the Basilica, Mudejar cloister, Gothic cloister and an auditorium building. Superior rooms have a bathroom (bath and/or shower), hairdryer, telephone, satellite TV, complimentary WiFi, safe deposit box and minibar. Junior suites have a bathroom (bath and/or shower), hairdryer, telephone, satellite TV, complimentary WiFi, safe deposit box and minibar. Set in the historic centre of Plasencia, in the northern region of Extramadura, the hotel offers the perfect location from which to explore the ancient city and its beautiful surrounding landscapes. This splendid Parador, housed in a former 15th century convent, has retained many original architectural features including magnificent archways, vaulted ceilings, Renaissance cloisters, spacious rooms and interior courtyards. 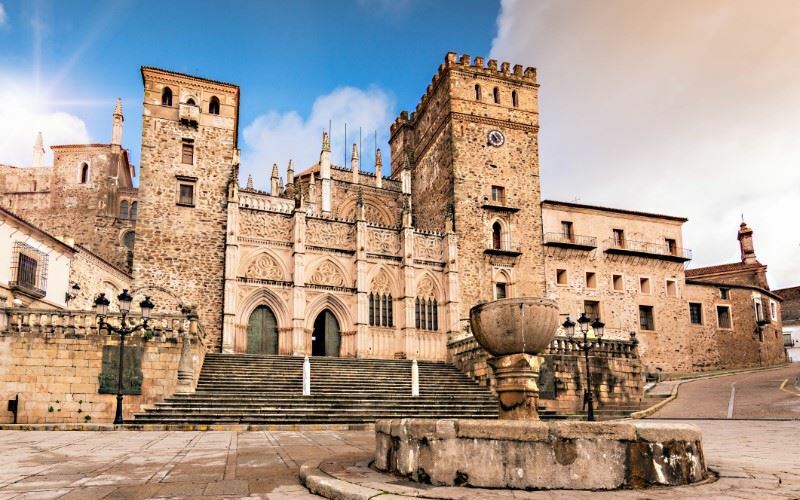 The city centre of Plasencia, declared a Cultural Heritage Site, has a wealth of historic buildings, palaces, cathedrals, an aqueduct, medieval walls and fortified towers and gates. Visitors to this area can explore the Sierra de Gata Mountains and Jerte River Valley, with its spectacular natural springs, cherry groves that are quite spectacular in Feb-Mar and the Monfragüe National Park. Here you will see gushing waterfalls, many nature trails, pretty historic towns and enjoy the local delicacies such as the delicious Ibérico ham and exquisite Torta del Casar cheese. Several parks surround the city but Los Pinos is of particular interest with its variety of birdlife, outdoor sculpture museum and extensive botanical gardens.